I've taken delivery of quite a few goodies this week. At the top of the picture is the huge box containing the Sengoku Basara One Coin Grande Figure Collection ~Eiyuu Shuuketsu-hen~ set. It's much wider than the six earlier boxed sets since it contains twelve figures rather than the usual ten, necessitating a redesign of the box shape. To its right is Drakengard 3 Collector's Edition from the Square-Enix shop, the western release of the unfortunately-titled Drag-on Dragoon 3. It's the first European release I've bought in ages and of course, there's something wrong with it - the Japanese audio doesn't work at all. From the game's introduction sequence I've determined that the English dub is atrocious so I've abandoned my hopes of trying to play until Square-Enix fixes the problem. It's exasperating since it wasn't cheap; I'll stick with imports in future. Four Diabolik Lovers audio CDs finish off the haul as well as a generous amount of bonus items. 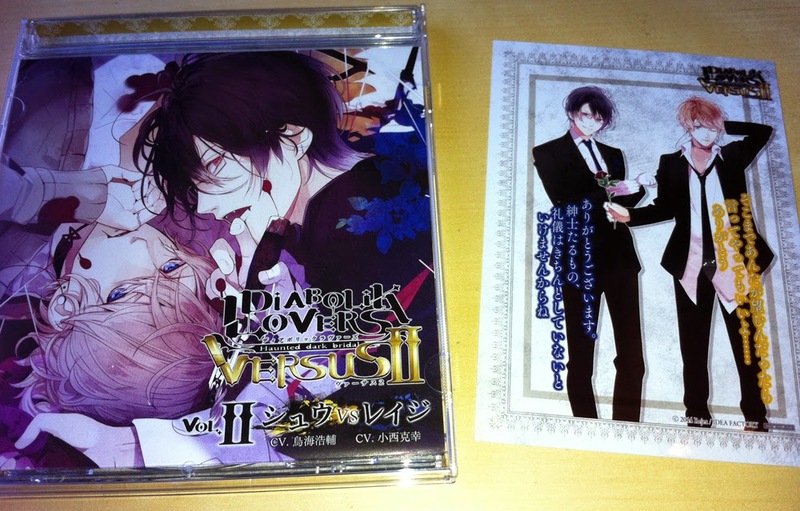 I'd been meaning to pick up the older Diabolik Lovers do-S Kyuuketsu CD: More, Blood Vol. 01 and vol. 02 discs so I added them to another order to save on shipping. They're joined by the new Diabolik Lovers Bloody Songs -Super Best- compilation (with a free A5 clear file, comment card and metal strap) and the Diabolik Lovers do-S Kyuuketsu CD: VERSUS II Vol. 2 Shu VS Reiji (with its free bromide). Here's a close-up of the latter. 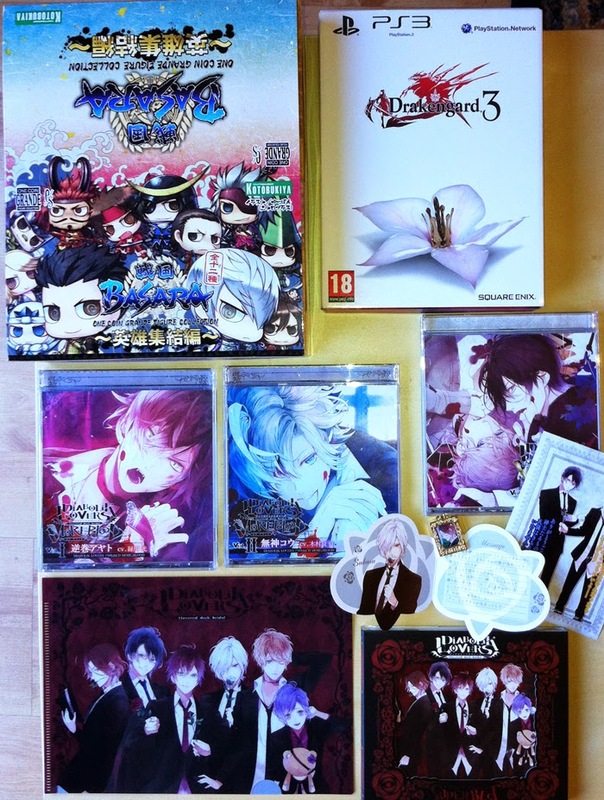 Next comes a better picture of the smaller bonus items which came with the Diabolik Lovers Bloody Songs -Super Best- CD. 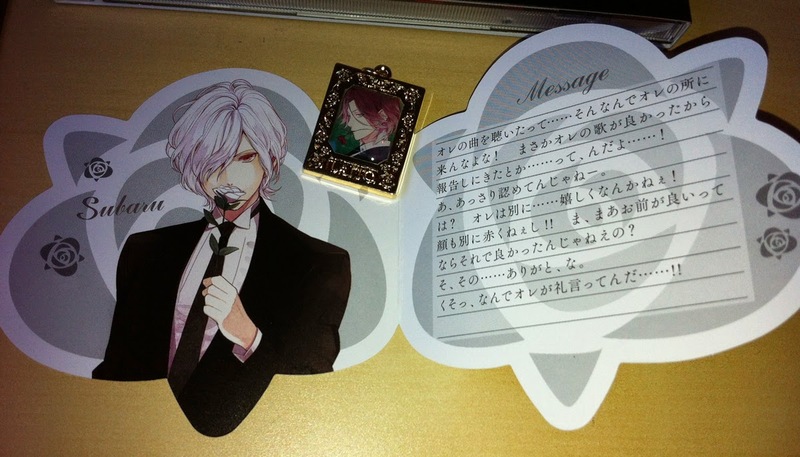 I chose the version which included Laito's metal charm since he's my favourite of the vampires, and the randomly-packed character comment card was the Subaru version. I'd rather have ended up with Laito's card too, but Subaru is still very pretty. 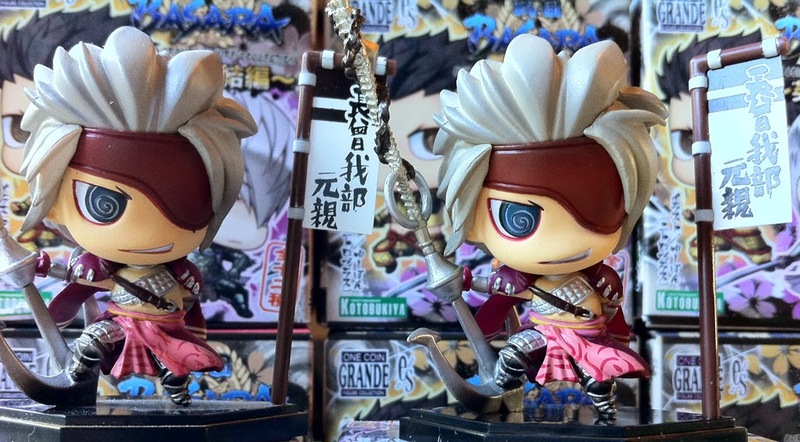 Going back to the Sengoku Basara One Coin Grande Figure Collection ~Eiyuu Shuuketsu-hen~ pack, the main reason for purchasing the set was to get the brand new Ieyasu and Mitsunari figures so I took a picture of them once I'd unpacked everything. 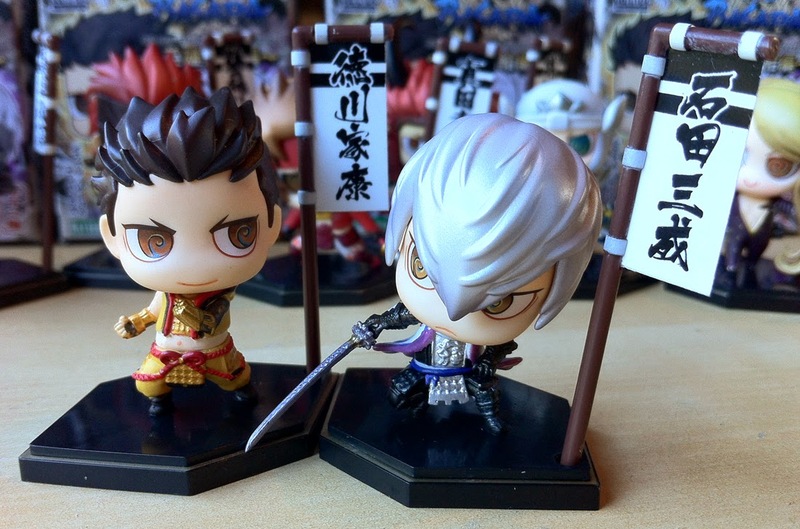 They're very nice additions to the range and I hope the rest of the missing Sengoku Basara 3 characters will follow. The other ten figures in the box were slightly reworked versions of the most popular characters from earlier sets. The differences are very subtle - here's Motochika showing off his improved paintwork which is most noticeable when looking at the pattern on the light pink fabric. The text on each character's name flag is thicker than it used to be as well. The old Motochika is on the left, with the new Eiyuu Shuuketsu-hen version on the right.